DRUGA DRUGA stands for the extra-curricular activities offered at II. gimnazija Maribor. The programme comprises an exceptionally large array of school activities and offers students the opportunity to develop their individual talents and creativity, thus encouraging their curiosity in different areas of interest. The activities are not a part of the national curriculum, but rather it is the school’s choice to offer them with the aim of helping students develop their skills. The activities take place after regular classes, during the weekends and term breaks and holidays. Druga Druga offers extra-curricular activities ranging from culture and art, scientific research to humanities, and from foreign language acquisition to competitions in a variety of subject areas. Druga Druga runs parallel to the national curriculum programme. Most students and members of staff take an active part in it, with an increasing number of other young people and mentors from the local community. The Druga Druga courses are financed through voluntary contributions by parents, sponsors, as well as public funding. Members of this club are introduced to the study of astronomy. They spend part of their time and research observing the night sky. One other aspect of their work is preparing for school competitions in astronomy. The school’s Ecology Club has been in existence for more than twenty years. 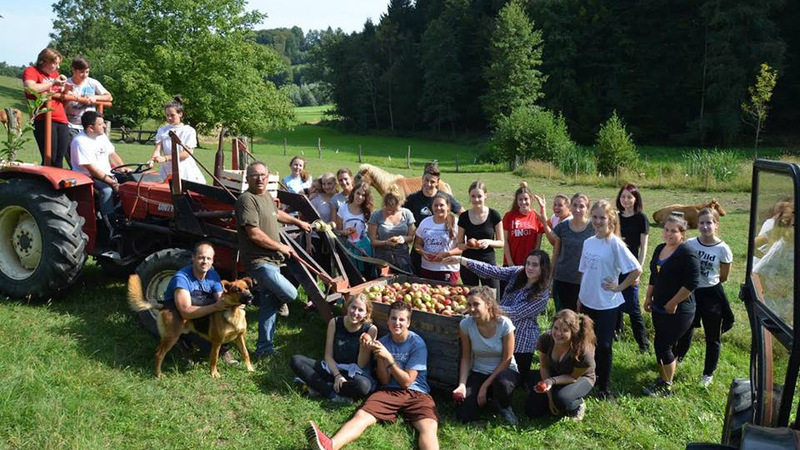 The school was the first Slovenian grammar school to join with the international project ‘Eco-School’. 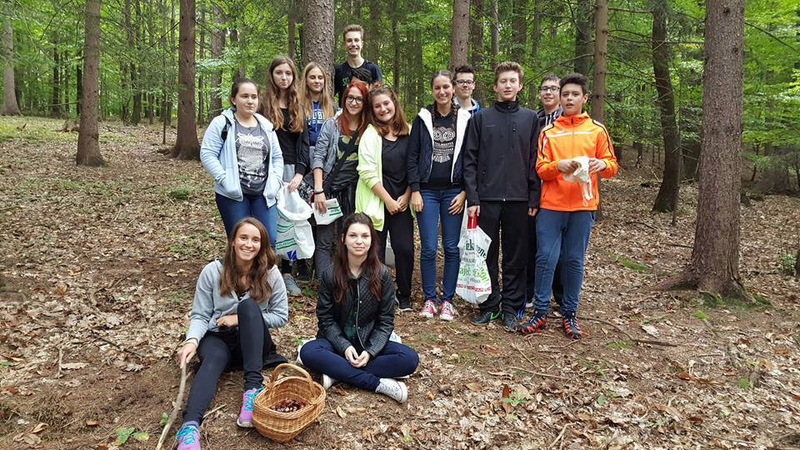 It is an initiative that campaigns, acts and educates on a range of local, national and global environmental issues in a way that it connects elementary and secondary schools in Slovenia and Europe. Club members aim to deepen their knowledge of mathematics, logic in particular, and prepare for national competitions in logic. This club is ideal for those intending to study and major in mathematics. Members of this club do practical work in the following areas of expertise: information technology and computer programming. A large number of students may expand their knowledge by working on a research project. After writing their research paper, they are given the opportunity to take part in competitions and receive a young researcher award. Students choose their research question by themselves, and, based on their area of research, choose their mentor or supervisor. Our school is proud to announce that every year a greater number of students’ research papers are regarded as exceptional. This ranks our school amongst the most successful schools in the country with regard to the number of outstanding research papers produced by students, thus giving the students excellent reference for further studies. Being a popular new trend in innovative technology, robotics attracts students who wish to gain knowledge in navigating and programming robots. This club offers its members an opportunity to deepen their knowledge of chemistry and prepare for chemistry competitions. This club organizes and coordinates trips to various European destinations. School excursions may last from one to several days. This way club members become familiar with foreign cultures in order to appreciate and compare them to their own. This club is one of the most successful school debate clubs in the country, and has won in the national championship, and also in international debate competitions in the English language (contestants from 15 countries and 49 teams, including the UK and the USA). In the 2014/2015 academic year, they were ranked fourth internationally. This club is designed for those who are interested in the subject of philosophy, and also enables its members to take part in philosophy competitions. In this club students become familiar with different methods of thinking and problem solving according to the system designed by Dr. de Bono. The club members met with Dr. de Bono during their school excursion to Malta. We at II. gimnazija Maribor find that volunteering fosters a great sense of solidarity, tolerance, responsibility and maturity. There are several ways students may volunteer: assisting senior citizens and young people with special needs, and helping primary and secondary school students improve their learning skills and knowledge (and seniors to acquire basic IT skills). II. gimnazija Maribor works together with approximately 20 local institutions where our students engage in volunteering activities, such as: homes for senior citizens, residential, educational, training and meeting youth centres, Centre for Hearing and Speech-Impaired People, Centre POLŽ (for people with intellectual and learning difficulties, drop-outs and people from sectors of society with low educational achievement), programmes for pre-schoolers and primary school children with special needs. Anyone who is interested in attending lectures by experienced travellers, expeditionists and adventurers is welcome to come and expand their cultural horizons. The EST was established in 1990. It started with the idea of teaching and learning in an alternative way. The EST has produced the following musicals: Cats, Les Misérables, The Phantom of the Opera, Grease, Aladdin, The Lion King, We Will Rock You and Feel the Beat. EST is one of the most notable extra-curricular activities at II. gimnazija Maribor. Not only does the EST always manage to stun the home crowd, but they are often invited to preform at other locations, and are praised around Slovenia (Cankarjev dom Ljubljana, Ljutomer, Festival Lent Maribor) and abroad (Sarajevo, Kruševac, Bolzano, Beograd), and have often been covered in the media. So far the performances have been seen by 100.000 people. The Druga Scena Student Theatre comprises exclusively of students attending II. gimnazija Maribor and focuses on comedy. Here, the students are not merely actors, but also co-creators of the play, and participate in the entire creative process. In the last six years, The Druga Scena Student Theatre has performed the social satire A Respectable Wedding by B. Brecht, the satirical sports-based comedy The Locker Room by D. Meglič, the comedy Boeing Boeing by M. Camoletti and the comedy A Styrian in Ljubljana by T. Partljič. A rendition of Jovanović’s comedy Antigone represents one of the theatre’s more serious pieces. The French Theatre is a student theatre that stages a play in French every year. 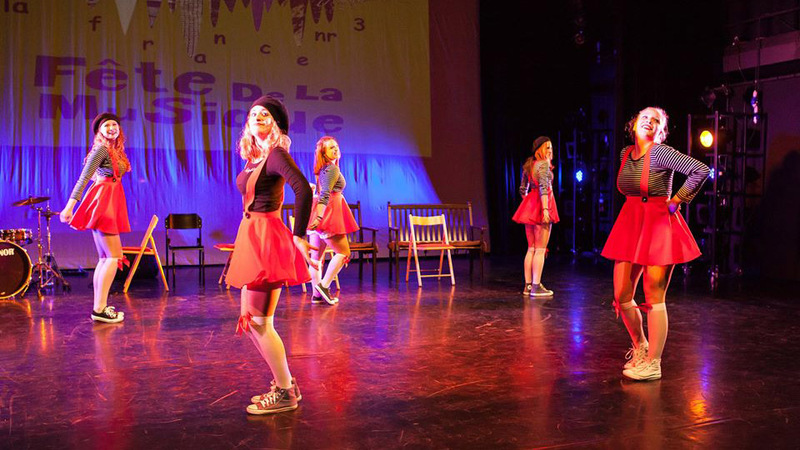 They traditionally perform their play in a festival with other French high-school theatre groups in France. Since 2006, the French Theatre at II. gimnazija Maribor has received an award every year, including 1st prize for the best foreign group, 1st prize for the best play, and 1st prize for the best female role. The Gnosis Student Theatre was founded in 1999 and is an avant-garde theatre that stages up to two performances a year. Regularly, they participate in the Transgeneracije high-school theatre festival in Ljubljana and in a number of other festivals. So far, they have performed plays by Kafka, Burges, Bartol, Huxley, Berlin, Müller, Brecht, Ionesco, Dürrenmatt, and Bond. The Gnosis Theatre has received several awards at the Transgeneracije theatre festival, at the Vizije youth theatre festival and at the Linhart best-amateur-group theatre festival. The Gnosis Theatre was a stepping stone for some prominent Slovene actors, such as Uroš Kaurin, Vito Weiss and Tina Vrbnjak. The Improleague at II. gimnazija Maribor focuses on providing the basics in improvisational theatre, where students acquire warm-up techniques and skills necessary for giving public performances. This is a cultural and educational program that both systematically and holistically educates the youth in the field of film production. It consists of three parts: lectures, pre-filming preparation, filming, editing and the screening of the film. In this 100-hour program, some excellent short films have been produced that have received numerous awards. Miha Hočevar, a renown Slovene film director, mentors the program. The Drug’ School Orchestra was founded in 2002 and comprises current and former students of II. gimnazija Maribor, as well as students from other schools who qualify to play in the orchestra. Every year, the Drug’ Orchestra prepares two thematically diverse programs featuring film music, musicals, classical music, rock, jazz and even popular Slovene songs. The mixed youth choir of II. gimnazija Maribor has been in existence for more than 50 years, having been founded in 1960. 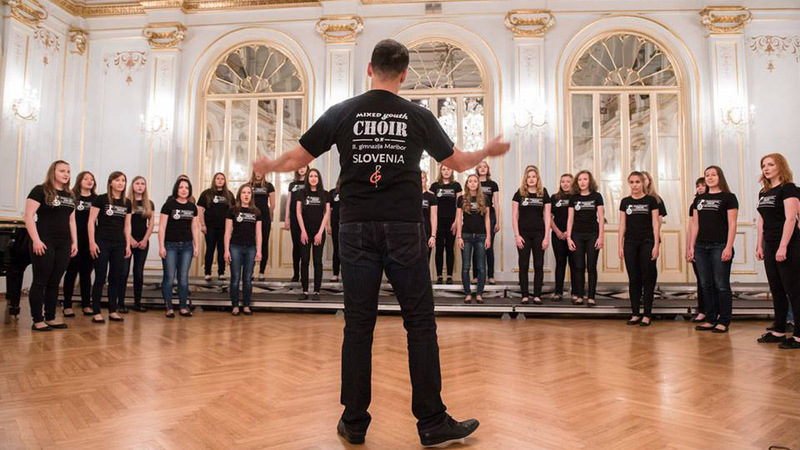 Amongst the choir’s better known achievements are its cooperation with the St. Stanislaus’ Institute, Prva gimnazija Maribor, and Gimnazija Slovenj Gradec, winning for the best-rated performance at a Maribor regional youth choir competition, winning a gold medal in the mixed youth choir category at Young Prague 2015, and its solo concerts. 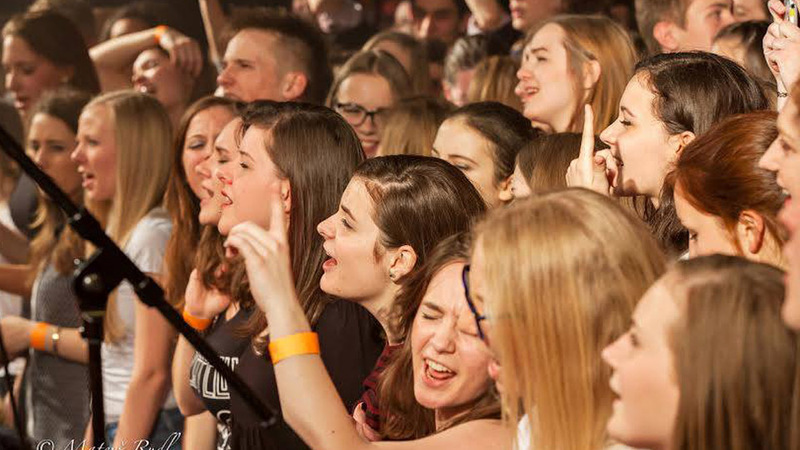 Pop & Rock Stories are a series of events that combine culture and music and enable students to have fun, dance and listen to music every year from March to April. Droogstock is a music festival where high school rock bands compete for a prize, which is the chance to make a record in a professional studio. is an event that is based on a conversation with a prominent Slovene musician; the entire event is prepared and organised by students. The Cultural Marathon is an event that lasts an entire night and comprises music, theatre and dancing in the school’s amphitheatre. The event finishes at 6am with breakfast in the school canteen. The Art Workshop explores different art practices and approaches with an emphasis on pictorial surface and spatial painting through a variety of tasks and different art genres. Students present their work at annual exhibitions. The exhibition hall in the lobby offers various kinds of topic based exhibitions: nature, mountains, cultural heritage, student creativity, etc. The Photography Club is designed for students who share a particular interest in documentary and artistic photography. They learn about digital as well as classic photography. The club also professionally documents all school events. The Conceptual Workshop is a presentation of conceptual art as contemporarily engaged and above all active art, and is presented in a scenic and theatrical sense. 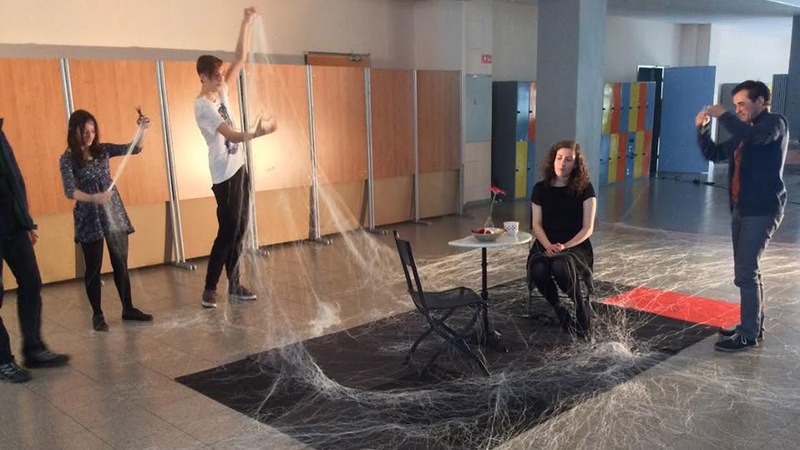 The practical work includes different smaller performances, exhibitions and installations, which are visually, substantially and practically developed and performed by students. 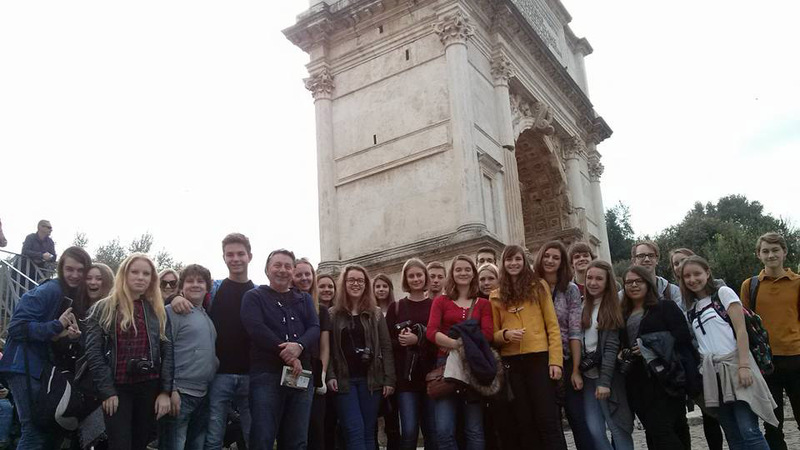 Students attend art history excursions in different parts of Europe, touring the finest art exhibitions and cultural attractions of European cities. An annual public exhibition where mainly former students of II. gimnazija Maribor, who are either studying art or are already established artists, present their works. This consists of two different activities having similar goals. Every year the main topic varies according to the chosen literary work being profoundly discussed and pondered on by students. Students also present their works at poetry tournaments, various competitions, and public readings throughout Slovenia. The Literary workshop annually publishes a collection of the best literary works by the students. Each year the school announces the Prešeren arts competition, which promotes students’ creativity. The best creations are presented with awards and recognitions. Students compete in different fields: photography, art, literature, music, film, dance, theatre. The competition boasts a tradition of more than 50 years with awards bestowed upon many students who are today renowned artists. A traditional event celebrating Culture Day, and is organised entirely by students. At the performance, the Prešeren awards are given out for the best student art work. The awarded art works are chosen by a committee within the Prešeren competition. The school offers many sports activities, several of them are covered in the school curriculum, others in the form of extracurricular activities, which also include Sports Days. The school has a volleyball, football and basketball team. We offer East Asian martial arts classes such as Shaolin and Taiji, hiking, adrenaline sports, ice skating, a variety of dance genres, rock climbing, martial arts, ultimate Frisbee, Zumba, Pilates, aerobics, table tennis, swimming, bowling, etc. ”Tigrice“ and ”Borci“ are dance-cheerleading teams who support our sports teams, especially at basketball games. They attend cheerleading competitions. Their acrobatic skills are an attraction at school events. For chess and strategy lovers. “Borec“ has been documenting the school’s events and happenings for the past 25 years. It covers the school’s current events and enables the development of student creativity, providing an opportunity to write on matters of the students’ own interests. Adding some typical challenges of working for the press, like keeping specific text lengths, choosing appropriate accompanying photographs and keeping the deadlines, this provides students with a feeling of working for a real publishing house. This way some of our amateur journalists have already discovered their passion and made it their profession. Some now renowned Slovene journalists have previously written for ”Borec“. The online international radio informs about current events and provides important news in English. It is primarily designed and run by the IBO students. It presents school events. It is published quarterly and is a free e-magazine received by subscribers via email. It provides students with information about important school events. Students prepare for literature competitions in foreign languages. The French Club organises meetings that are split in 4 different activities, the so-called Café Littéraire, Chansons Françaises, Court Métrage and Gastronomie. Each Wednesday another topic is discussed from different perspectives using different approaches. Depending on different international dates and celebrations, each month is dedicated to a calendar-based topic (e.g. International Book Day, International Women’s day, International Water Day, International Human Rights Day …). A fragment of a discussed literary work was also presented at the French festival of high school theatres, called FETLYF, in Saint Malo (South-western France) and at the Francophone evening. Students are presented with the challenge of organising their tour of London. They need to plan the complete trip on their own, choose and book the flight and accommodation, put up an itinerary and include as many sights, gallery and museum visits as possible, yet keep the tour at a reasonable price. The “Kick off English” programme aims at motivating students to do additional regular work, which helps them overcome the fear and reluctance of English and possible difficulties or gaps in their knowledge of English.The weekly meetings provide students with valuable advice from psychologists and English teachers, offering additional exercises in the weaker learning fields (grammar, vocabulary). The mentors regularly monitor the students’ progress. Receiving help and support from the Confucius Institute Ljubljana, II. gimnazija Maribor was able to open the Confucius Classroom in May 2013. The purpose of the classroom is to motivate students to learn Chinese and promote Chinese culture. At the beginning of February 2014, the Confucius classroom organised the first Chinese Days, presenting different workshops like calligraphy, preparation of Chinese cuisine, exhibitions, and the celebration of the Chinese New Year. In May, they organise a “Chinese Day” in the city centre, giving the citizens of Maribor the opportunity to get to know the Chinese culture and cuisine. 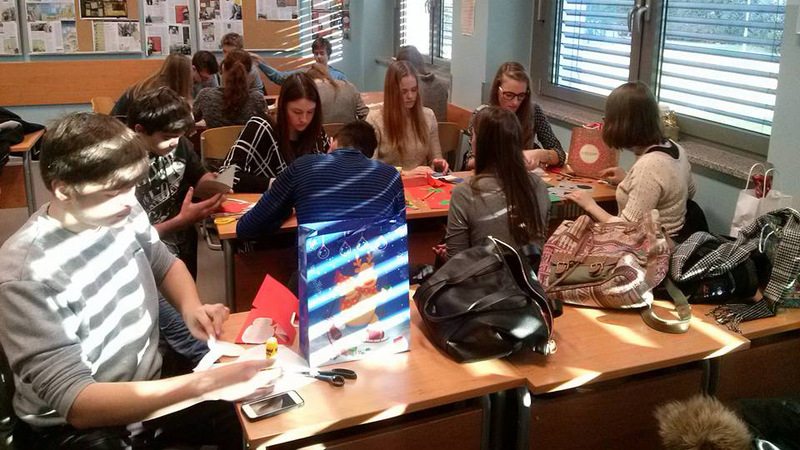 Each year, approximately 25 students attend the Chinese course taught by a Chinese teacher and a Slovene sinologist. We offer a number of reasonably priced optional language courses, which take place once or twice a week in small groups. Additionally, we offer special courses qualifying the participants for international examinations in English, German, French and Spanish. These courses offer quality preparation programmes as well as necessary information regarding the exams. We direct or accompany the participants to Slovene institutes holding the examinations. HOLIDAYS AT DRUGA present an exciting way to spend free time for pupils of primary schools aged 11 to 14. 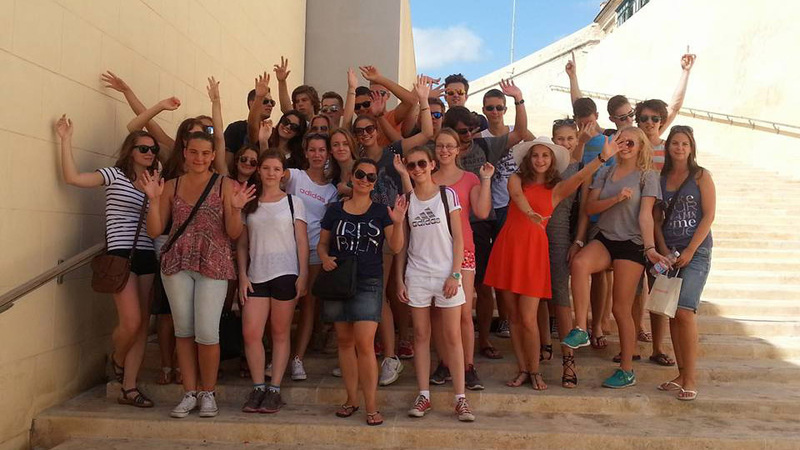 This year there were two programmes offered – sciences and the French language. Holidays at Druga offer knowledge in the field of Biology related to other fields of science in a relaxed atmosphere, and workshops in which pupils are engaged in interesting activities in order to get to know the French language and its culture. The academic activities are accompanied by a number of sports activities, enabling the participants to be active, not only academically but physically as well. The festival of Youth is the annual highlight of the international spirit at II. gimnazija Maribor. It consists of 5 spring days of endless creativity in the form of workshops, cultural events, excursions and parties. There are about 160 participants annually (foreigners and our students) who come from more than 10 different countries. Throughout the years we have had students from the following countries: Slovenia, Croatia, Serbia, Macedonia, Italy, Poland, Slovakia, Bosnia, India, Spain, Sweden, Israel, and Russia. The foreign students are hosted by our students from II. gimnazija Maribor, who also participate in all of the festival activities. Spring festival is an excellent way to overcome cultural, racial and national differences and present the potential of youth creativity, which has always been so inspiring. One of the school’s missions is also developing social aspects for oneself and society. Special Olympics is a collaboration with The Primary School Gustav Šilih. 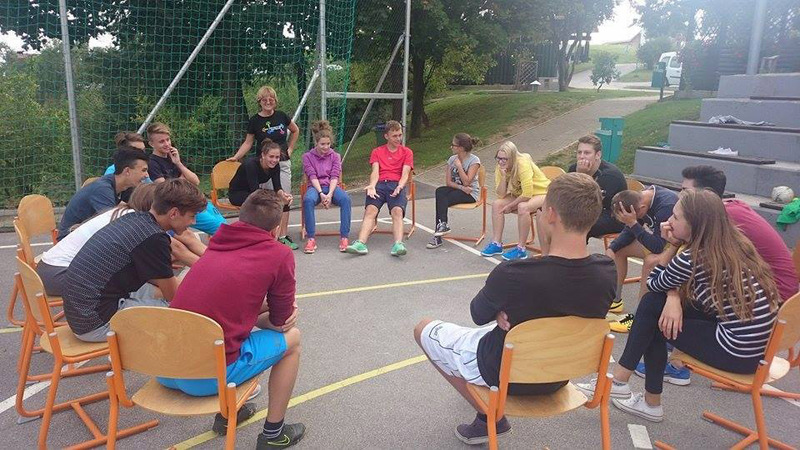 The students prepare sport and creative activities together with their mentors. They also create a small show together with special-needs students. This is beneficial for both parties as our students learn new skills and special-needs students spend a day a bit differently and also learn something from our students. II. gimnazija Maribor pays special attention to competitions in different fields. We organize special preparatory classes which enable our students to get the best results at state and international level competitions, even Olympiads. In the 2014/15 school year our students participated in the following competitions at state level and beyond: Physics, Mathematics, Computer Science, Economics, Debate, German, English, Spanish, French (as a second Language), Logic, Astronomy, Slovene as a Mother Tongue, Sciences, Geography, History and others. We have won 46 golden, 137 silver, and 452 bronze awards in the 2014/15 school year. We are especially proud of our students who participated in the International Olympiads in the following fields: Chemistry, Physics, Mathematics, Sciences, Astronomy and Philosophy. They won three silver medals.